Train Station: We need many modes of transport for our many travels. From corporate offices in metro cities to rural areas often in remote locations, a user researcher traverses many worlds. It is no surprise that to follow this kind of career, one needs to be organised, adaptable and ingenious simultaneously. Hureo does a lot of research in the field, testing various products with real users. Since users can be anywhere, the field work often spans different states covering several cities over thousands of kilometers. Travelling all that distance while conducting research at par with the highest international standards is strenuous. Taxi: When the team had to drive around Mumbai during the monsoons and got lucky with clear roads. Airport: While trains and buses are adventurous, flying to our destinations has its own benefits! Auto: In the middle of Mumbai cab drivers strike, the team needed to find a way. Organizational skills: A well planned day with multiple contingencies will keep you calm in the face of any critical situation. For Jahnavi, a senior UX researcher at Hureo – it is all about making a plan and sticking to it. The more hectic the day is, the more well planned it needs to be. She loves the travel, the interaction with new people and the fact that she is now visiting cities that she has always wanted to see. As an extremely organised person, Jahnavi seems unfazed by the challenges. It is a great ability to recognise something as chaotic and still tackle it in a calm, organised manner. Forgetting a small piece of equipment like an adapter has the power to ruin your study. When the roads are not kind and locations are remote. Care for details: To tackle a challenging environment, be as prepared as possible with great care for details. Arunima, another researcher at Hureo, talks about all the things that need to be done in a lot more detail. The back to back sessions that need to be conducted to the point where breaks are at a high premium. She says that she has learned a lot from her colleagues on how to do work under tight schedules and high pressure situations and she is getting better and better every day. Be good with people: If you enjoy working with people, the job becomes more fulfilling. 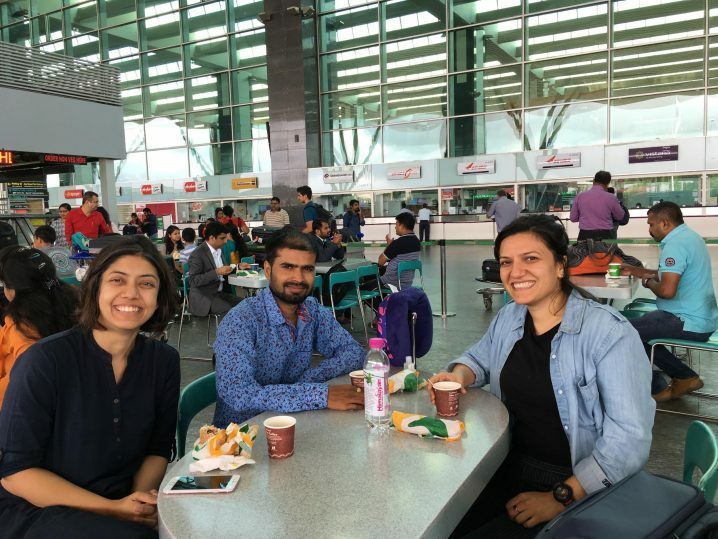 Arunima is also excellent at recruiting participants for the study and coordinating with various recruitment agencies – a critical part of ensuring that a study is successful. It is a credit to her that her favorite part of UX research is meeting and interacting new people on the field, and her ability to focus and enjoy the work even when on a gruelling schedule is what makes her a great researcher. Delicious jalebis, a local sweet, for a sugar rush in Punjab during a field visit. The vegetarian thali served during a field visit to a hospital in Hyderabad. Collaboration & teamwork is key: As a leader, one must ensure all the team members are on the same page and working efficiently together. Anjeli, Hureo’s founder and most experienced researcher, divides the uncertainties between things that cannot be avoided and things that must be prevented and how to go about it. The team needs to be really comfortable with each other and it is her job to make sure that happens. You cannot have discord on the field when the hours are long and work is intense and she keeps everyone focused and working in multiple ways. Discretion and judgement are necessary: There will always be situations and one needs to know how to manage them. There are some things that no one can avoid. Anjeli recalls interesting incidents where they were conducting a study at someone’s house and the couple began fighting. At that time, she says – it is important to be discreet. One silently switches off all the recording and stops the study and waits patiently for the conflict to end. “Of course if it is very chaotic, one needs to intervene and handle things.” She says being a UX researcher is all about discretion and judgement. Keen observation during research: Proper experience and attention will transform the quality of your data.Jahnavi often uses body language cues and knowledge-based questions to see if the subject is not being truthful. “Very often, the point is not what the lie is but why they are lying” Jahnavi says. These details can reveal a lot during UX research. Be aware of the context: Right from what you wear to how you act can have an impact on the study. As a UX researcher, it is important that the data be unbiased. What is common amongst all the members of team Hureo is the care with which they present themselves in various environments so as not to affect the quality of the data. Health is crucial: Long travels and uncertain hectic schedules take a toll on the body and the mind. The leadership at Hureo are fitness freaks, they take care of their health and incorporate the same practices in the team. It is difficult to get good meals while travelling and according to Anjeli, lunch is the most difficult to tackle. They handle this challenge by putting one team member in charge of food and snacks, buying lots of fresh fruits and vegetables. A nutritionist is also consulted. This does not stop them from enjoying amazing local food though. It is one of the many reasons they love their job. When the power went off and the team was stuck on 10th floor and schedules can’t be compromised. Researchers ended up carrying their heavy luggage all the way down. A researcher walking around a University Campus. Back up everything, then unwind: Ensure no data is lost and everything is catalogued the moment you are back. The first thing that one needs to do is to make sure all the notes and data is stored, synced and backed up on the cloud. Reliable internet is not available at many places and this step is critical even if you are exhausted. After that, the team takes a day off to rest after a long field trip. Develop a routine: Get the best out of yourself so you can focus and work even when you are in a comfortable space. The data analysis is Jahnavi’s favourite part of the job. While the timings are still strict and there is always a deadline looming in the distance. There is no travel and it is less hectic. Work involves coming together for collaborative discussions and then retreating to one’s own space to carry out the work assigned to them. Researchers in an intense discussion, planning the logistics for a study. Take command of your space:– Find out where and when you can to do different work the best. From here onwards the team starts compiling the analysed data, writing the report and presenting their findings to the client. This phase involves wrapping up the work that has gone on for several months in constant collaboration with the client. The ending evokes many emotions; there is the satisfaction that the project has been completed successfully and the client is happy with the findings, but also the realisation that you will not be in touch with people whom you have worked with for months. But after a long project, everyone is up for a celebration that the team enjoys together. Chandrakant is a writer with a strong background in scientific research, content development, education and social media. He is also a popular spoken word poet and has performed his poetry all over the country.